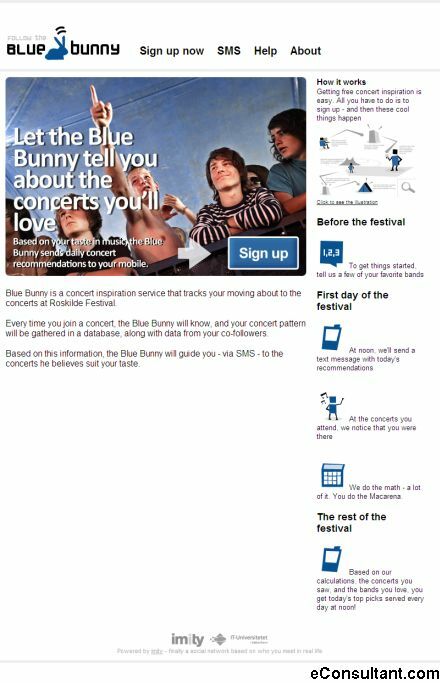 Description : Blue Bunny is a concert inspiration service that tracks your moving about to the concerts at Vesterbro Festival. Every time you join a concert, the Blue Bunny will know, and your concert pattern will be gathered in a database, along with data from your co-followers. Based on this information, the Blue Bunny will guide you – via SMS – to the concerts he believes suit your taste.